It's not exactly the 1973 Westworld revisited, is it? I hope you read my overall Westworld review that was shared after I had the opportunity to watch the first four installments, because we're jumping right into episodic reviews today. If you're anything like me, after watching Westworld Season 1 Episode 1, you've already picked a side. You're either most interested in the park from the perspective of the creators and management, from the hosts who were created to entertain guests, or from the guests themselves. All three allow for valid viewpoints and interesting discussion, which is different than the original Michael Crichton movie. Back then, the bots (and they didn't feel like much else then), were pretty much painted as the bad guys, killing the guests when they went out of control. Then again, the whole concept was so new. We didn't walk around with computers stuck in our pockets. We didn't ask our phones and watches for directions or to call our mom. Siri didn't tell us jokes. Our world has changed. Maybe we're (I'm) just more cognizant of our foibles as humans, so placing ourselves in the role of bad guys isn't so difficult anymore. Whatever the reason, I found it impossible not to view the hosts as victims. Guests go to Westworld for varying reasons, but the interactions once there seem limited in their scope, such that the appeal is most grand for the action oriented or visitors with an evil streak. Despite the guests in the premiere being fairly well rounded – the lone man in black, a married couple and a family of three – two of those ultimately focused on the more violent pursuits available at the park. 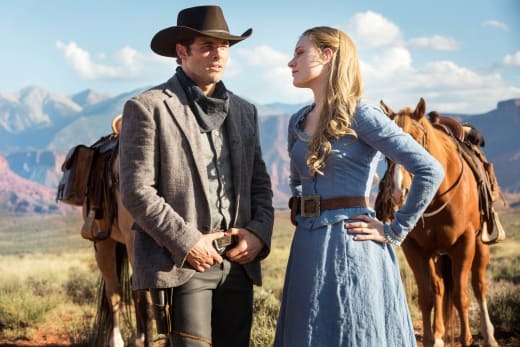 What more could the family have done other than treat Westworld like a dude ranch? When we arrived on the scene, the hosts had just undergone a software update by one of their creators, Dr. Ford. He's still fiddling with their code, trying to perfect the line. The latest alteration gave them reveries, gestures that make them just one step closer to humanity, as they are accessed based upon memories that shouldn't exist. You know what this means? It means that we're done, that this is as good as we're gonna get. It also means that you must indulge me the occasional mistake. It makes you wonder exactly what Ford is hoping to achieve after all of these years. If he has created a herd of near-human robots who have stored memories despite a daily wipe of their system, and they are created as playthings to be murdered, raped and treated as livestock, then what kind of man is Dr. Ford? Scary thought. Dolores is the oldest host of the park, having been wiped more than any other. She's one of the star attractions, and the man in black makes sure to stop in for a pillage before he begins his greater quest. It's through him that we discover some of the most interesting things about the park, because he knows it so well. I never understood why they paired some of you off. It seems cruel. Then I realized winning doesn't mean anything unless someone else loses. That means you're here to be the loser. The stories that play out across Westworld, which seems like an unending world when you look at it on the platform behind the scenes, are fascinating. I would like to better understand how they are supposed to function. Lee was seriously freaking out over the idea more than a few would need to be pulled to fix their glitches, but given the enormous size of the park and how the majority of them seem autonomous in their daily actions, it seems silly that they would find that an issue. And can't any number of them be out of play at a guest's whim, interrupting the stories in the same way? The answer is yes, and there's really not a good answer for why the theatrics continue so well or why the guests don't interrupt them more frequently. I'd also like to know if new guests come in every day or if there is a three day window when guests are locked into the park, etc. If the stories are so important to the overall experience and one gets pulled by a guest, what happens when the next train rolls into town? When Peter found the picture, he went totally off script on his own. He became about as human as I could have imagined, questioning what was in the photo, wondering about the world outside his ranch. But that was nothing in comparison to Watson, who was killing all of his enemies. That was such a chilling development. The memories these hosts must have on their hard drives that have been erased and reprogrammed over and over makes rolling back successfully seem highly unlikely. Walter kills other hosts all the time. Exactly. And he'll remember again. And that was, essentially, the gist of the premiere. The park is playing with things they don't understand. The mistakes that were discussed just while we were within earshot should have been enough for them to understand that and take precautions. Instead, they seem oblivious. On one hand, they talk about memory wipes. Everyday they're wiped clean. Yet reveries rely on memories to work properly. The hosts were created to make minor improvisations based upon...what? If it's the breadth of their experience, those minor improvisations would surely grow over time. And would need memories, which means the wipes are not pure. What has grown between Dolores and her father over time didn't seem artificial. His drive to protect her was as real as any father's drive to protect their daughter, and thinking of the number of times he's seen her ravaged and been unable to stop the intrusion upon their home would send any real man into fits of rage. He showed despair. Dr. Ford: What is your itinerary? Peter: To meet my maker. Dr. Ford: Ah. Well. You're in luck. And what do you want to say to your maker? Peter: A most mechanical and dirty hand [laughs]. I shall have such revenges on you...both. The things I will do, what they are, yet I know not. But they will be the terrors of the earth. You don't know where you are, do you? You're in a prison of your own sins. Decommissioning Peter with tears in his eyes was horrific. Was Bernard whispering in his ear? Bernard appears softer than Dr. Ford, and is most definitely not on the same footing as his coworkers. They're viewing the park by way of investors, enhancements, money. Bernard is different. The way he held the photo of a child in his hands after Stubbs earlier implied Bernard was a man without children says there is a lot more to Bernard than meets the eye. 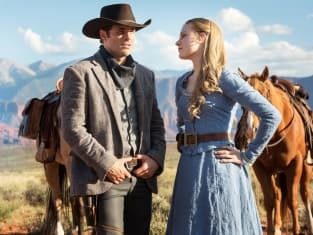 There is a lot more to all of the characters in Westworld than meets the eye. They just don't know it yet. To quote the Abernathy's: These violent delights have violent ends. The man in black (who should probably be called something else) wants to get to the deeper meaning of Westworld. He's looking for it in the scalp of the hosts. Ideas? I'm so busy thinking about the characters and the consequences of their actions that the violence doesn't stand out to me. How did you view the hour? Over the coming weeks the discussions will be even deeper. What makes someone human? Should someone ever be allowed to play out their greatest fantasies without repercussions? Should we ever play God? Hit the comments and talk about Westworld. I could talk about it forever. There is so much to discuss, and I've only brushed the surface. Why not take a stab at it and get the conversation started! !